There are currently 7 different races with several different shields available by each. Each Shield has a resistance rating, much like weapons, that make them more durable than your other components. Curiously Roboforge doesn't offer much difference in shield resistance ratings. Nearly all shields available have the same rating of 90%. The only two exceptions to this are the Standard Shield and the Standard Square Shield which offer only 86% Resistance. As noted, Weapons are the only other component to offer Resistance ratings. All weapons have the same Resistance rating of 93%. Resistance ratings are an indication of how durable a Shield or Weapon is. When damage is applied to either of these components types it is reduced according to its rating. If 100 points of damage is applied to a 90% Resistance shield then the damage is reduced by 90% to actually only be 10 points of damage. A 93% Resistant weapon sustaining a 100 damage point hit will really only take 7 points of damage. Weapons are favored by many people to be used as shields because of that higher rating. Not only that, but a weapon also delivers damage bonuses (See "Weapon Values" in the Design Tips Section) so that while protecting your bot and its components you are also returning damage to the attacking piece. But weapons are much more expensive than shields. Although they do not provide the same advantages as weapons, they do offer you some protection at a cheaper price, perhaps protecting crucial areas of your bot so that it has time to counter the attack. Shields come in many different shapes and sizes and offer different attachment points. It is difficult to truly rate the value of a shield based on its cost and health because its very design may provide or exclude benefits. 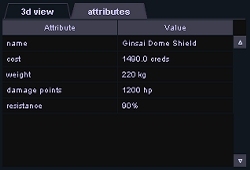 An example of a good value shield is the Raiken Ginsai Dome Shield. It is one tough shield to break thru with 1200 points for health. Add in its Resistance bonus and the Dome Shield is operating on an apparent 2,280 health points (HP * Resistance% + HP or 1200 * .90 + 1200 = 2,280). WOW! It even sports 220 kg of mass (with no Damage Bonus of course). Let's compare this to the Volker Vraska Jackhammer. 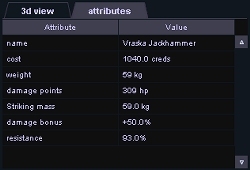 The Jackhammer costs 1,040 credits, has 309 health points, weighs 59 kg with a 50% damage bonus, and offers a Resistance Rating of 93%. With its Damage bonus (Mass * Bonus% + Mass or 59 * .5 + 59 = 88.5) its mass becomes an effective 88.5 kg and with the Resistance Value its Hp become 596.37 (HP * Resistance% + HP or 309 * .93 + 309 = 596.37). So ... what do you think would happen if we pitted the Volker Vraska Jackhammer against the Raiken Ginsai Dome Shield? Which would break first? Who would win? Click below to download a test of this battle. Just unzip the file and place the .rec and .sta files into your Roboforge/battle/ directory. I've run this test a few times with various weapons. That Dome Shield is a tough nut. But why in the demo did the Dome Shield bot lose (other than the time running out lol). Simply put, even tho the Jackhammer was destroyed it did much more damage to the shield. It just happened that the Jackhammer had less health and thus was destroyed first. I also pitted the Dome Shield against the Standard Weapon which is only 100 credits cheaper than the shield with the same results. Testing against the Raiken Dui Ne Ram brought both the Shield and the Ram to destruction at the same time. Ok, you may be thinking "So what, the shield bot still lost". That is true, but remember, your shields are not there to win the fight for you. They are there to protect your bot while your weapons dish out the damage. If the opponent attacks your shields and loses a weapon in the process then your bot will be receiving no more damage from that enemies weapon. Here is a list of the various shields and what their Cost per Hp value is. Although this can be a good guideline to figure out if your getting your moneys worth, this list cannot take into account other attributes of shields such as their shape, size, and connection point locations.